“Is the engine on?” I ask the delivery driver who’s giving me a quick run-through of the bells and whistles in the Toyota C-HR Dynamic Hybrid 1.8. 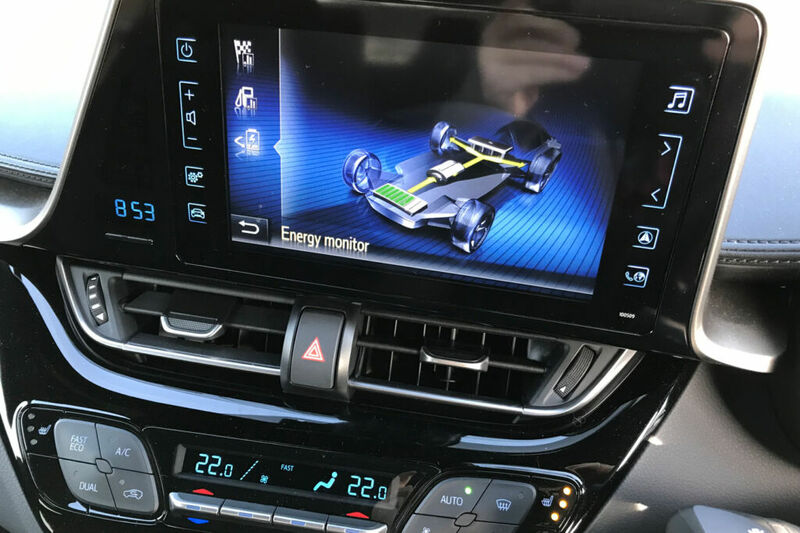 Small wonder that e-vehicles are now being fitted with fake engine noises – not just to alert unwary pedestrians, but to alert drivers too. You can tell that my ‘other’ car is petrol – loud and clunky and full of car noise. The C-HR glides out of my driveway with barely a sound, such is its finesse. So what exactly is a hybrid-electric vehicle? Is it the best of both worlds? 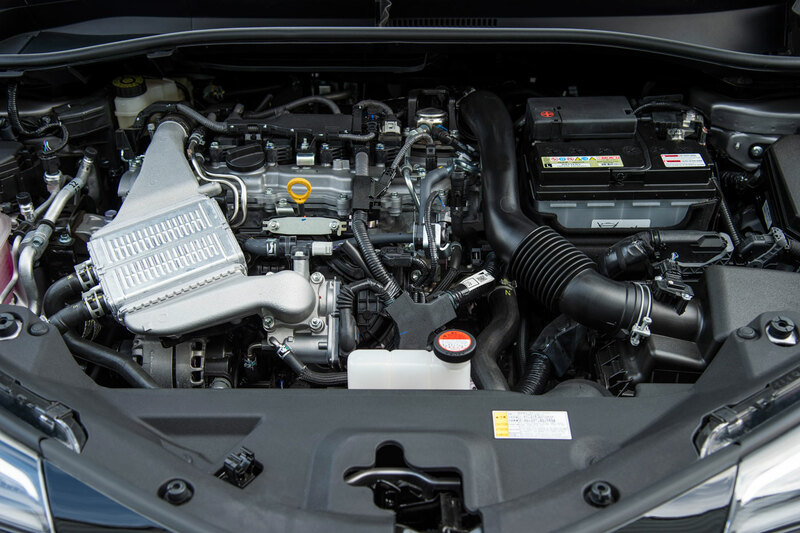 Simply put, hybrids run on a petrol engine and an electric motor. Both engines can work in tandem – and separately. 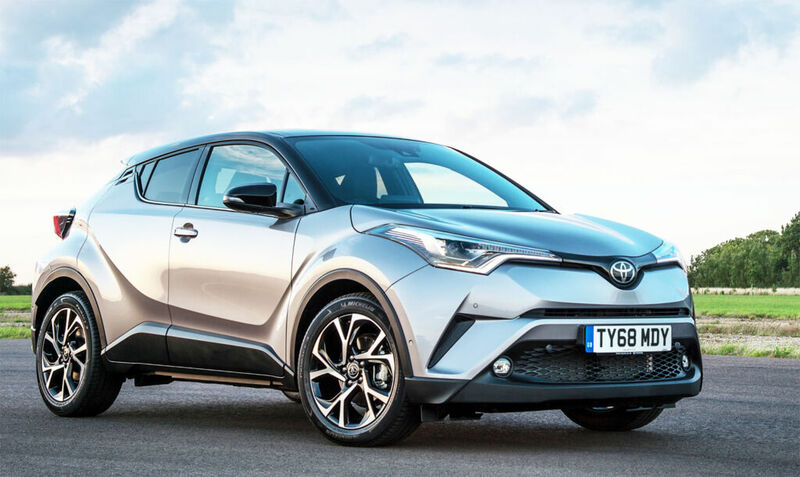 The benefits: Zero fuel consumption, no nasty fuel emissions and a very quiet drive for up to 50% (according to Toyota’s research) of urban journeys. And of course, hybrid cars have been measured to have lower CO2 figures than petrol-only driven cars. But before I take off for my near-silent drive in this crossover SUV, a quick look at the exterior design of the C-HR Hybrid. 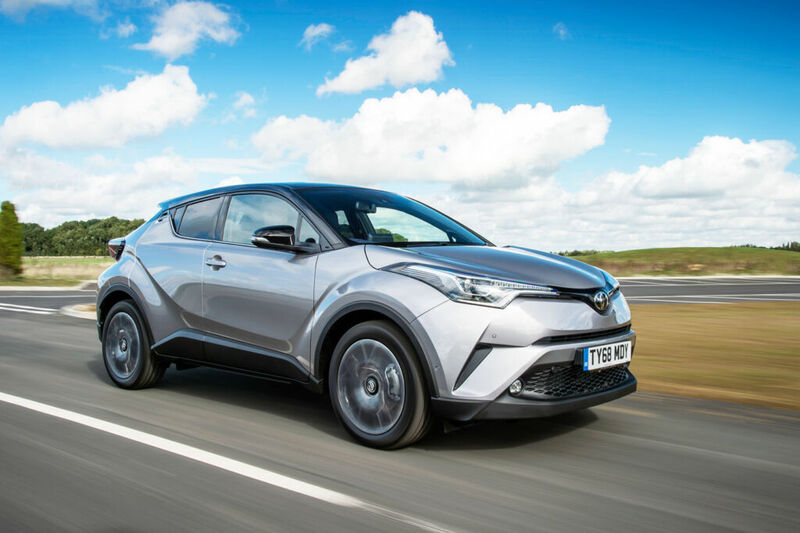 Very sci-fi, the Toyota C-HR has a unique look and stands out on the road. I didn’t see anything else like it during the test. Its commanding sporty shape with deep muscular haunches is eye-catching, ditto her powerful stance that gives an impression of movement, even when motionless. The sweeping roofline, sculpted aggressive body, angular deep-set headlights, generous side skirts and cantilevered rear spoiler are very stylish. Privacy windows at the back and rear side windows, and the colour-coordinated aerofoil and fin give the car an upmarket gangster vibe. Her 18-inch alloys complement the sporty stance. 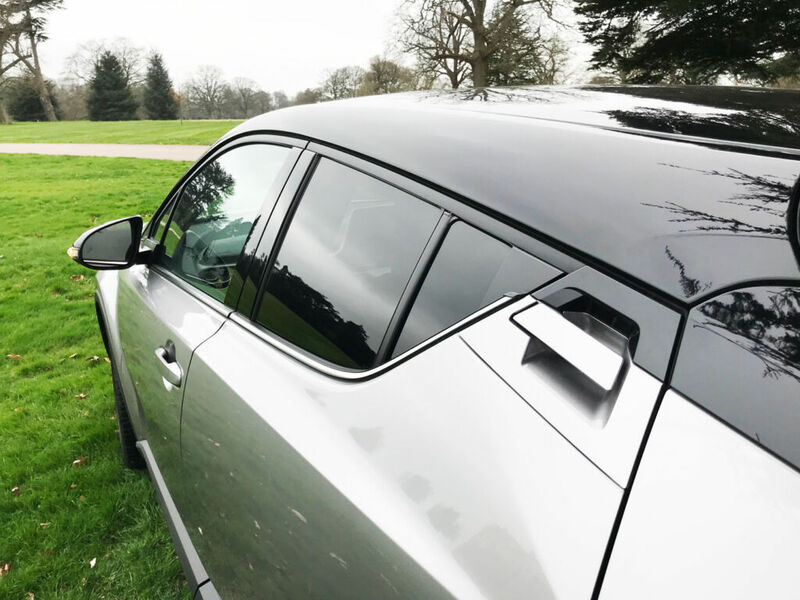 I like the inserted flush handles on the rear doors giving the SUV a more coupe-like appearance – and joy of joys – the rear window has a demister and wiper (little things matter). LED daytime running lights are standard, as are bright LED headlamps for after dark. 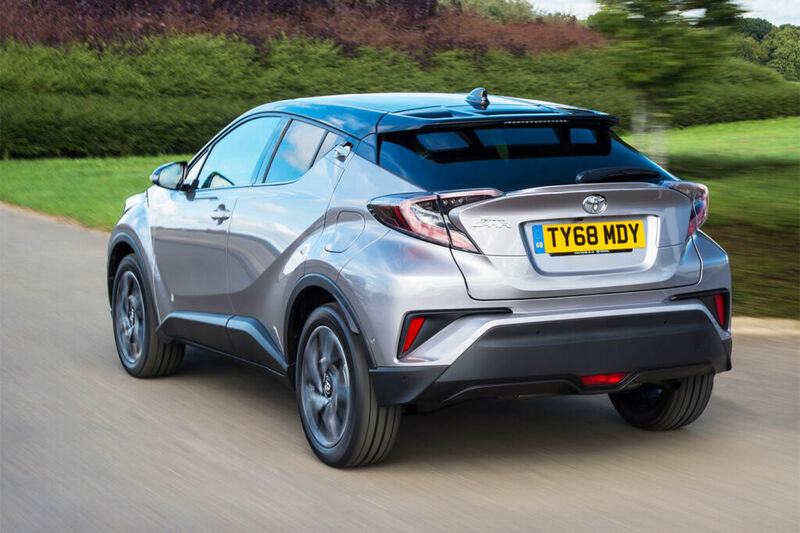 The C-HR’s cabin is well designed and ergonomically intuitive – the wide windscreen gives me ample sight well ahead. The rear window is small though and was trickier to see out of – especially since it has privacy glass. 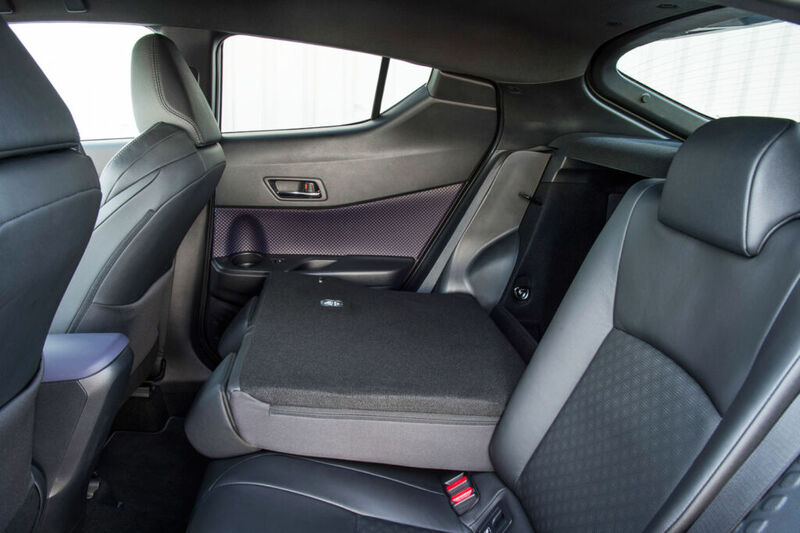 The driver’s seat is height and length adjustable with additional power lumbar settings (on the driver’s seat only). Heated sport front bucket seats are bliss – especially during our cold, rainy not-quite-spring-yet weather – and very comfortable. And the setting is on the main panel to the left of the steering wheel is much easier to use than switches found on door handles. Headrests can be tricky beasts – not so with the C-HR’s incorporated headrests that are a good fit for my noggin. 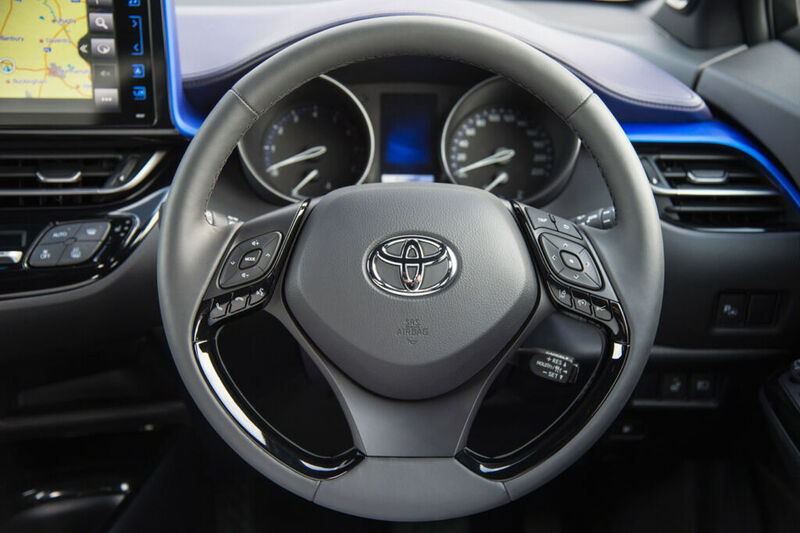 The leather steering wheel is well positioned with smart controls, but it feels hard on the hands after a few hours’ driving. Some padding here would be great. Door mirrors are also heated and fold automatically. Nice touch. 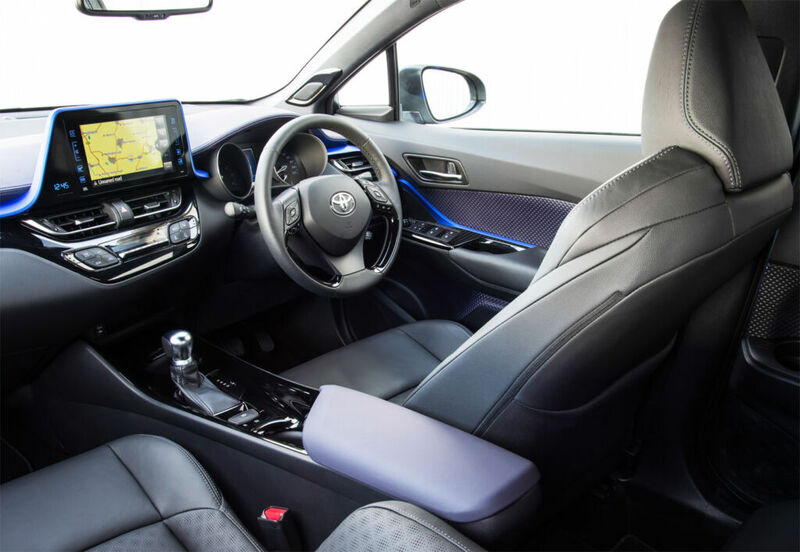 The gear shift in this C-HR 1.8 Hybrid is also leather bound and is easy to use. Toyota’s use of dual-zone climate control is brilliant – no more arguments from passengers about too hot or too cold. 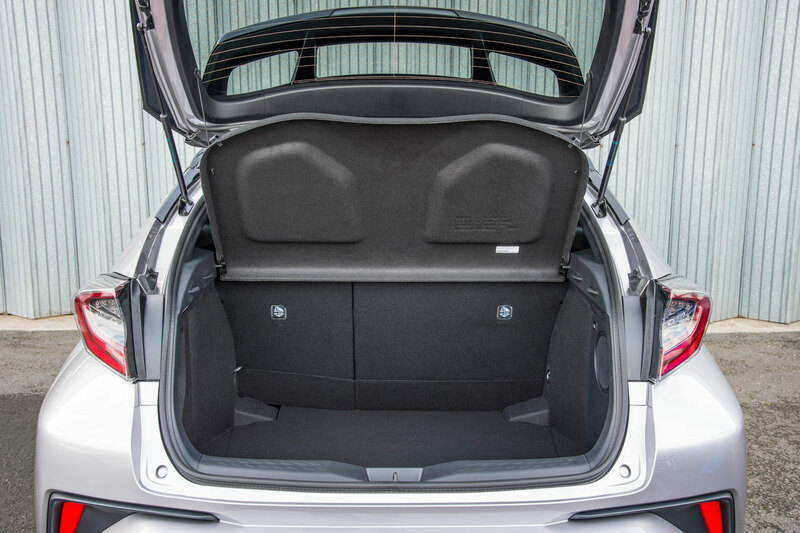 I can vouch that the comfortable rear seats carry three adults in comfort – and the 60/40 split seats make for generous space for shopping, pushchairs, golf clubs and suitcases. If you have children, you may find the low roofline somewhat tricky when bending to unstrap them from the Isofix points. The rear doors don’t open that wide either. The C-HR Hybrid has a good 8-inch touchscreen that I found easy to read, even in bright sunshine. 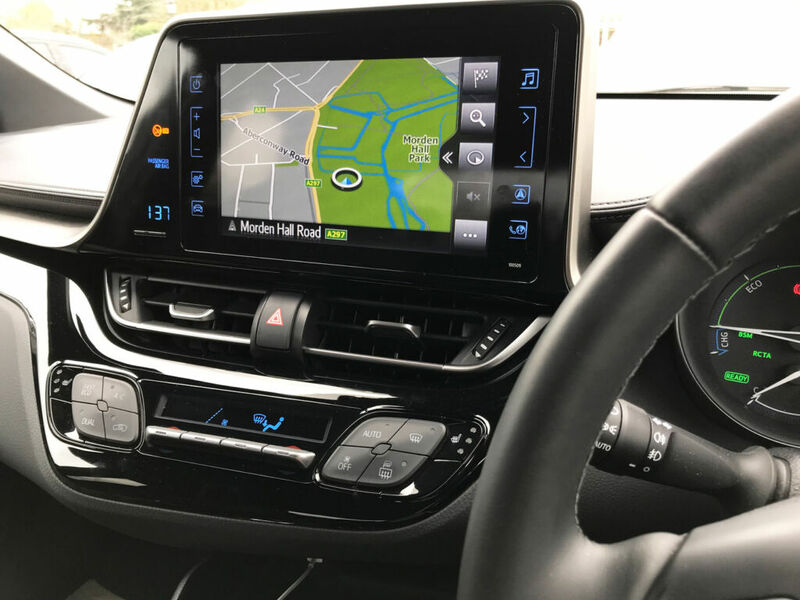 The SatNav is excellent with efficient traffic warnings, and as you’d expect it has on-line connectivity with Bluetooth and USB and AUX ports. I’m a die-hard reverser that prefers to turn around in the car, but am gradually trusting the excellent rear-view camera. Between the speedo and rev dials is Toyota’s 4.2-inch colour multi-function display which gives all the info you need at once: average mpg, drive modes, and journey information. I love the nifty auto-folding mirrors – just press a button on the door handle. And for people who lose keys, worry not – the C-HR has a smart key system with a push-button start so you can leave the keys in the cup holder. The park button can be engaged manually or set it to automatic. 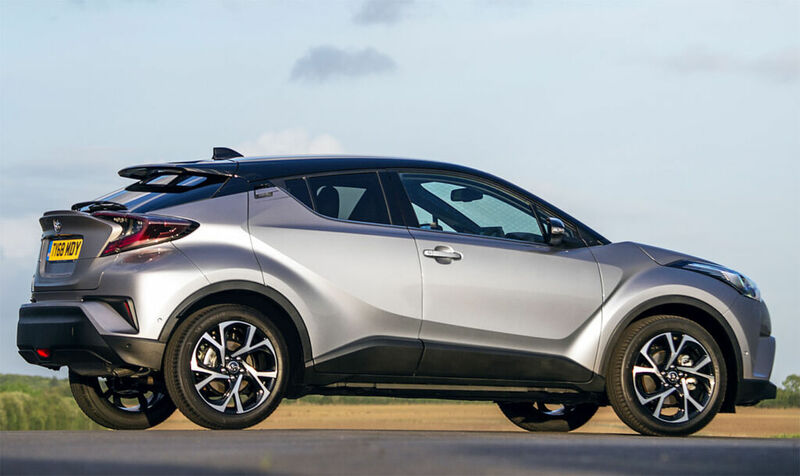 Boasting three drive modes: EV, Eco and Power, the Toyota C-HR is designed for efficiency and power. Although not the fastest off the block (0-62mph in 11 seconds) her 1.8-litre, 4- cylinder engine managed 70mpg average for urban and motorway during my test. Once in higher revs, she moves well and is a beautiful drive on the motorways where I did most of my driving. Around town too she’s smooth and responsive, taking corners with ease and felt balanced and stable – even in pouring rain and sleet. A large ‘BRAKE’ warning sign in red letters appears on the screen in front of me when a car in front stops unexpectedly. Great touch. It does it again when a pedestrian gets too close to the bonnet. Thank you Pedestrian Detection! Other useful safety features on the Toyota C-HR include the lane departure alert which was especially welcome on the M4. And a Rear Cross Traffic Alert which is brilliant when reversing out of parking spaces where there’s often a blind spot – or a pillar in multi-storey car parks – that obscures passing vehicles. And I especially like the ‘follow-me-home’ headlights which are a nice touch if you have to park your vehicle on the street at night. Great value for money, excellent performance and a very comfortable drive. Recommended.